Liquid called bile helps the body digest fats. Bile is produced in the liver. 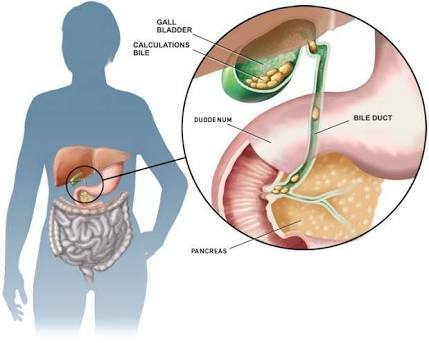 Approximately 700 to 800 ml bile flows directly into the intestine through a duct called the CBD (common bile duct) and about 40 to 50 ml is stored in the gallbladder as a reserve until the body needs it to digest fat. The gallbladder contracts and pushes the reserved bile into the CBD that carries it to the small intestine, when fatty food is ingested. Bile contains water, food is ingested cholesterol, fats, bile salts, and bilirubin. Bile salts break up fat, and bilirubin gives bile and stools a brownish, yellowish colour. If the liquid bile contains too much cholesterol, bile salts, or bilirubin, it can precipitate into stones. There are two types of gallstones: cholesterol stones and pigment stones although majority of stones are mixed stones. Gallstones can be as small as a grain of sand or as large as a golf ball. The gallbladder can develop just one large stone, hundreds of tiny stones, or almost any combination. Gallstones can block the normal flow of bile In hepatic ducts, which carry bile out of the liver, the cystic duct, which takes bile to and from the gallbladder, and the common bile duct, which takes bile from the cystic and hepatic ducts to the small intestine. Bile trapped in these ducts can cause inflammation in the gallbladder, the ducts, or rarely, the liver. Another duct which opens with the common bile duct is called the pancreatic duct, which carries digestive enzymes out of the pancreas. If a gallstone blocks the opening to the common duct, digestive enzymes can become trapped in the pancreas and cause an extremely painful inflammation called Gall stone pancreatitis. If any of these ducts remain blocked for a significant period of time, severe damage to the gallbladder, liver, or pancreas can occur which can sometimes be fatal. Warning signs of a serious problem are fever, jaundice, and persistent pain. Gall bladder is a pear shaped thumb size organ present close to the liver. Its function is to store and concentrate bile juice which is secreted by liver for digestion of fats. Scientists believe cholesterol stones form when bile contains too much cholesterol, too much bilirubin, not enough bile salts, or when the gallbladder does not empty as it should for some reason i.e. fasting, pregnancy. The cause of pigment stones is uncertain. They tend to develop in people who have cirrhosis, biliary tract infections, and hereditary blood disorders such as sickle cell anaemia. Gender: Women between 20 and 60 years of age, are twice as likely to develop gallstones as men. Age: Practically all age groups but more common in 3rd & 4th decade. Pregnant women, women on hormone therapy, and women who use birth control pills. Steady, severe pain in the right upper abdomen that increases rapidly and lasts from 30 minutes to several hours. Pain in the back, between the shoulder blades. Many people with gallstones have no symptoms. These patients are said to be asymptomatic, and these stones are called “silent stones”. They do not interfere with gallbladder, liver, or pancreas function. Many gallstones, especially silent stones, are discovered by accident during tests for other problems. But when gallstones are suspected to be the cause of symptoms, the doctor is likely to do an ultrasound examination. Ultrasound uses sound waves to create images of organs. If stones are present, the sound waves will bounce off them, showing their location. Blood tests: Blood tests may be used to look for signs of infection, obstruction, pancreatitis, or jaundice. Gallstone symptoms are similar to those of heart attack, appendicitis, ulcers, irritable bowel syndrome, hiatus hernia, pancreatitis, and hepatitis. So, accurate diagnosis is important. Nonsurgical approaches are used only in special situations such as when a patient’s condition prevents using an anaesthetic and only for cholesterol stones. Stones recur after nonsurgical treatment in majority of cases. Surgery to remove the gallbladder is the most common way to treat symptomatic gallstones. The standard surgery is called laparoscopic cholecystectomy. For this operation, the surgeon makes 3 to 4 tiny incisions in the abdomen and inserts surgical instruments. A telescope transmits the inside view through a miniature video camera on to a video monitor. The camera sends a magnified image from inside the body to a video monitor, giving the surgeon a view of the inside of the abdomen. The surgeon uses the instruments to carefully separate the gallbladder from the liver, ducts, and other structures. Then the cystic duct is cut and the gallbladder is removed through one of the small incisions. Since the abdominal muscles are not cut during laparoscopic surgery, patients have less pain and fewer complications than they would have had after surgery using a large incision across the abdomen. The recovery process usually involves only one night in the hospital, followed by a few days of restricted activity at home. If the surgeon discovers any obstacles to the laparoscopic procedure, such as infection or scarring from other operations, the operating team may have to switch to open surgery. It is called “open” surgery because the surgeon has to make a 5 to 8 inch incision in the abdomen to remove the gallbladder. This is a conventional major surgery and may require 2 to 7 days stay in the hospital and a few weeks at home to recover. Open surgery is now required only in less than 2% of gallbladder operations. The most common complication in gallbladder surgery is injury to the bile ducts. An injured common bile duct can leak bile and cause a painful and potentially dangerous infection. Mild injuries can sometimes be treated non-surgically; major injury however, is more serious and requires additional surgery. If gallstones are in the bile ducts, the surgeon may use ERCP to remove them before or during the gallbladder surgery. Once the endoscope is in the small intestine, the surgeon locates the affected bile duct. An instrument on the endoscope is used to cut the duct, and the stone is captured in a tiny basket and removed with the endoscope. This two-step procedure is called ERCP with endoscopic sphincterotomy and CBD stone removal followed by Lap Chole a day later. As yet Laparoscopic Cholecystectomy (Lap Chole) has limited role to play in G.B. malignancy. 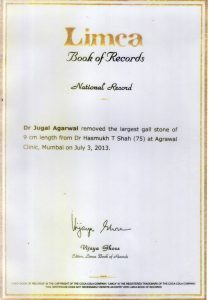 We have by now performed more than 20,000 Lap Choles (one of the highest volumes in India) and also have safely and successfully removed the largest gall stone in the country which is of 9cm in length. This is an unparalleled achievement for which we were recognized by LimcaBook of records in 2013 and this record is unbroken yet. Our track record for all indications mentioned above is with less than 0.1% mortality and 0.05% Common bile duct (CBD) injury and less than 1% infection rate. This is rarely matched by any other center. Coexisting CBD stones if detected preoperatively, can be easily managed by therapeutic G.I. endoscopy. Intra operative fluoro-cholangiogram can be performed and the CBD stone can be cleared in the same sitting with good results. Its referred as LCBD exploration. We routinely perform this whenever indicated. In heredity Spherocytosis, Lap Chole can easily be combined with splenectomy. We have performed such surgery in 6 cases so far. Don’t People need their Gallbladders? Fortunately, the gallbladder is an organ that people can live without. Losing it won’t even require a change in diet. Once the gallbladder is removed, bile flows out of the liver through the hepatic ducts into the common bile duct and goes directly into the small intestine, instead of being stored in the gallbladder. However, because the bile isn’t stored in the gallbladder, it flows into the small intestine more frequently, causing diarrhoea rarely. Also, some studies suggest that removing the gallbladder may cause higher blood cholesterol levels, so occasional cholesterol tests may be necessary. What to do if the stones are found on routine investigation without any prior symptoms? Earlier it was felt that it was better to leave the asymptomatic stones alone till the symptoms occur. Now with the advent of laparoscopic cholecystectomy, which involves minimal distress, it is better to get the gall bladder out than wait for the symptoms and complications to occur. If you are diabetic with gall stone, we advise Cholecystectomy routinely. What are the Restrictions after the Surgery? There are no restrictions of diet or physical activity. The patient is allowed a normal diet and normal physical activity after few days of surgery.